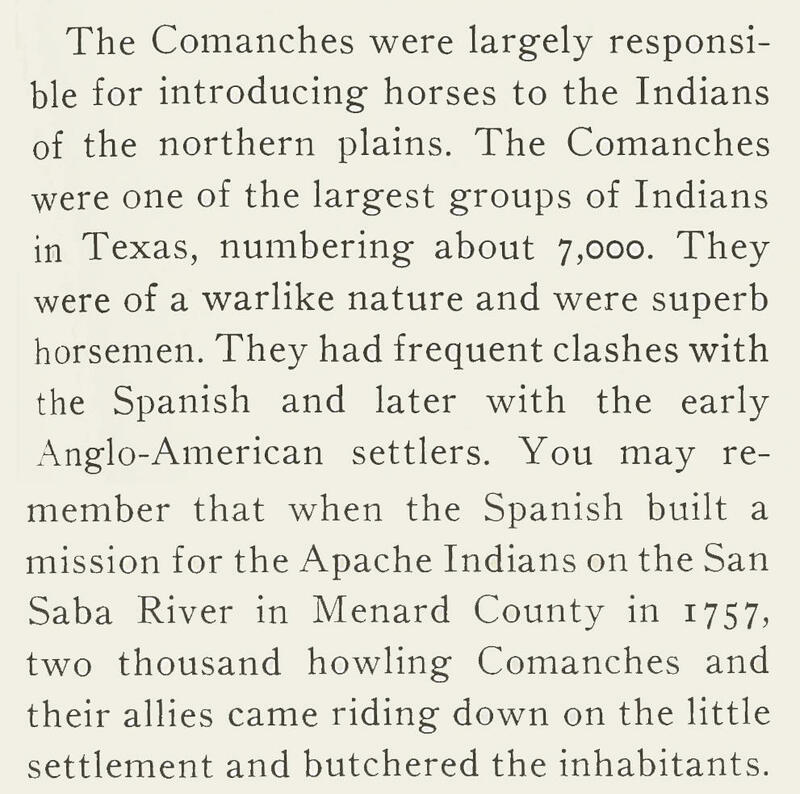 A screenshot of the 1954 textbook "The History of Texas." 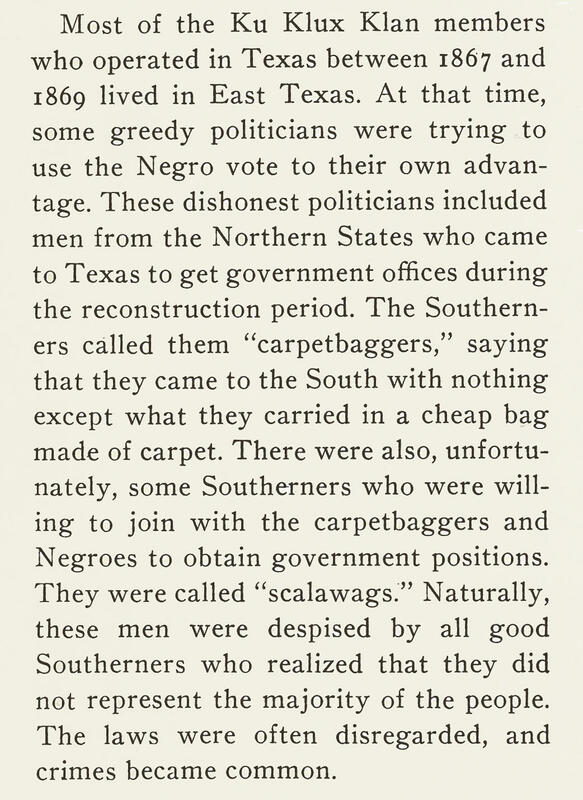 A seventh-grade Texas history textbook, published in 1954, which was written by two middle school principals – one from Marshall and one from San Antonio – shows how textbook bias can become more apparent with the passage of time. Historians say the exclusion of women and minority narratives from these books can leave children who don't seem themselves reflected in the history less interested in the material. 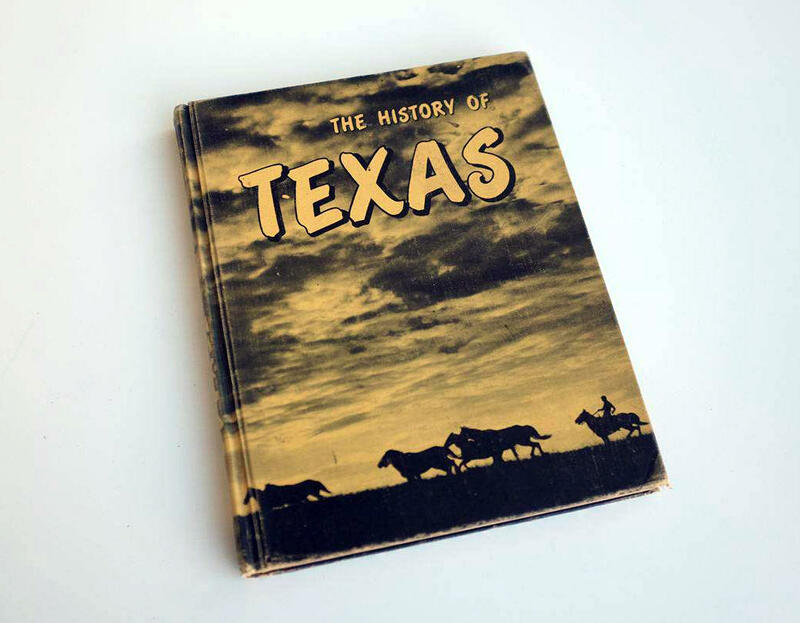 This textbook was used by public school students across Texas in the late 1950s and early 1960s, so it helped shape the perceptions and attitudes of people who today would likely be in their ‘60s. Sam W. Haynes, another historian who analyzed this book, said two things in particular jumped out at him. The other thing that stuck out to the University of Texas at Arlington professor and director of the Center for Greater Southwestern Studies was its characterization of Texas culture through the years. 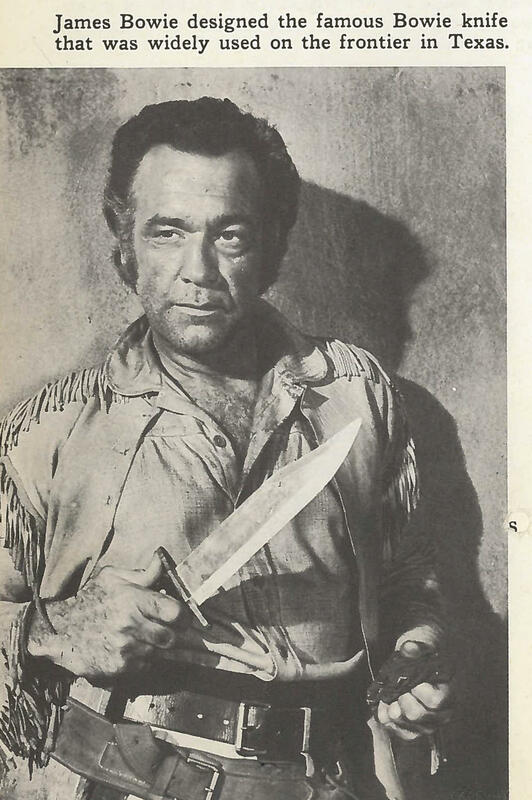 The authors of this 1950s Texas history textbook sought to make the Anglo-Americans stand out as even more heroic and upstanding than was perhaps necessary. What the Texans were doing was certainly worthy of attention, even if you didn’t agree with it. But one excerpt about the Alamo is also telling, says Jesús Francisco de la Teja, the former official state historian and Texas State professor, who also analyzed the text. 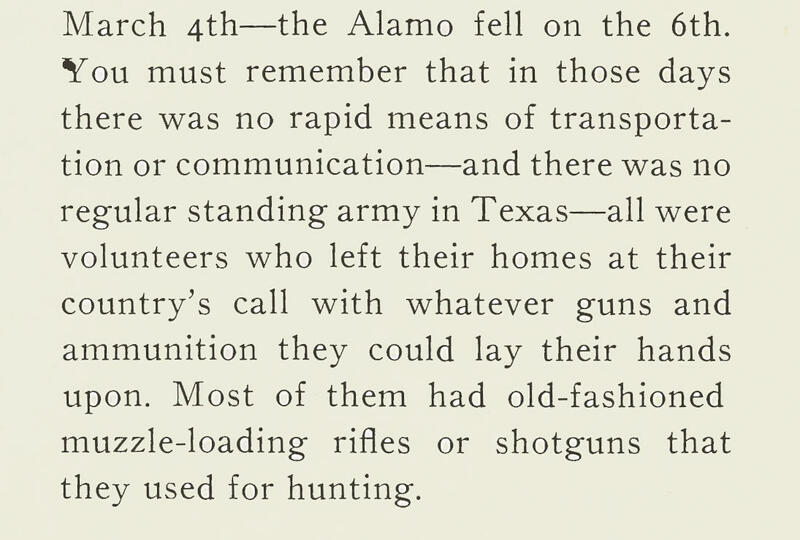 “Even in 1954, people knew that the Mexicans weren’t any better armed than the Americans and in fact, the Brown Bess, which is what many of the Mexican soldiers were using, were actually antiquated surplus Napoleonic war weapons that was all that Mexico could afford at the time,” de la Teja said. De la Teja says, from a technical point of view, the Anglo-Americans were much better equipped than the Mexican Army when it came to small arms. 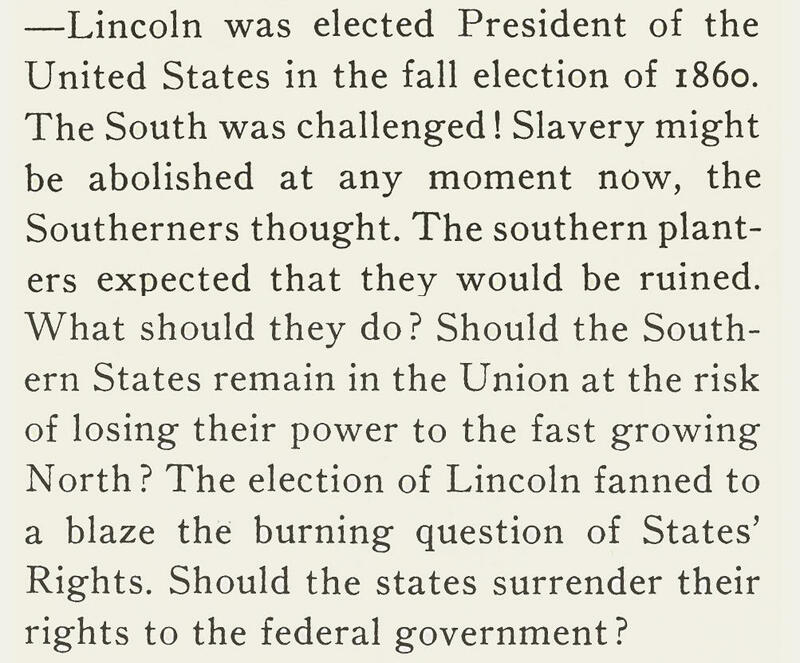 Walter Buenger, a professor in the history department at Texas A&M University, read the chapter in the textbook called “The War Between The States,” which, he says, is a “definite tip-off” that the book looks at the Civil War from a Southern point of view. The textbook acknowledges that slavery at least played a role in the Civil War, but it also treats African-Americans as sub-humans, and again, only defines their history in terms of the convenience of slavery to Anglo, white property owners. Then there’s the chapter on what happened after the Civil War. Benjamin Johnson, an associate professor of history at Loyola University in Chicago, says that description of Reconstruction was the most difficult thing swallow. 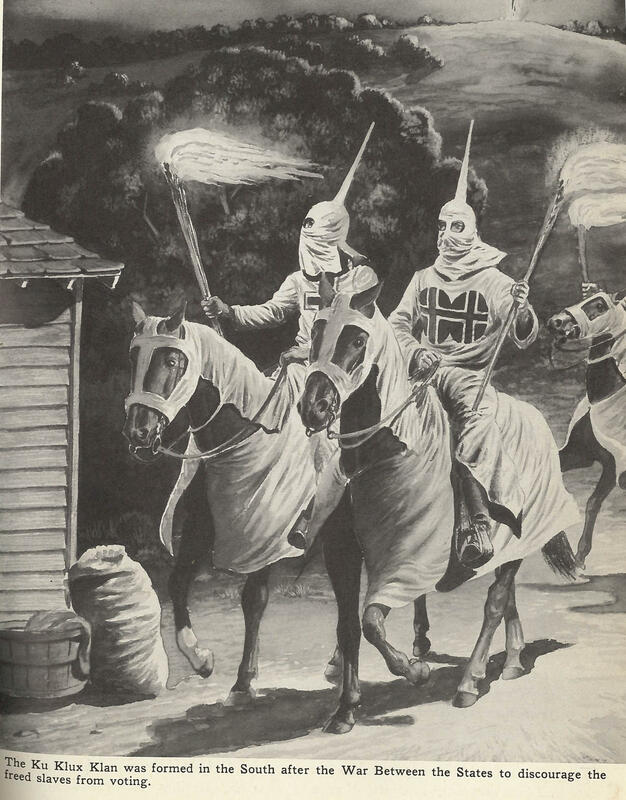 An illustration of the Ku Klux Klan from the 1954 textbook. Buenger agrees. He says academics taught a whole generation to think of African-Americans as “children who were easily misled” after the end of slavery, which he says translates into modern day racism. Jones says that choice to leave out non-Anglo Texans out left them at a disadvantage. “[T]hose who are left out of that story are left to fend for themselves and to either reform it, to challenge it, or to recreate it and to re-write it in a way that includes them and includes their story,” Jones said. 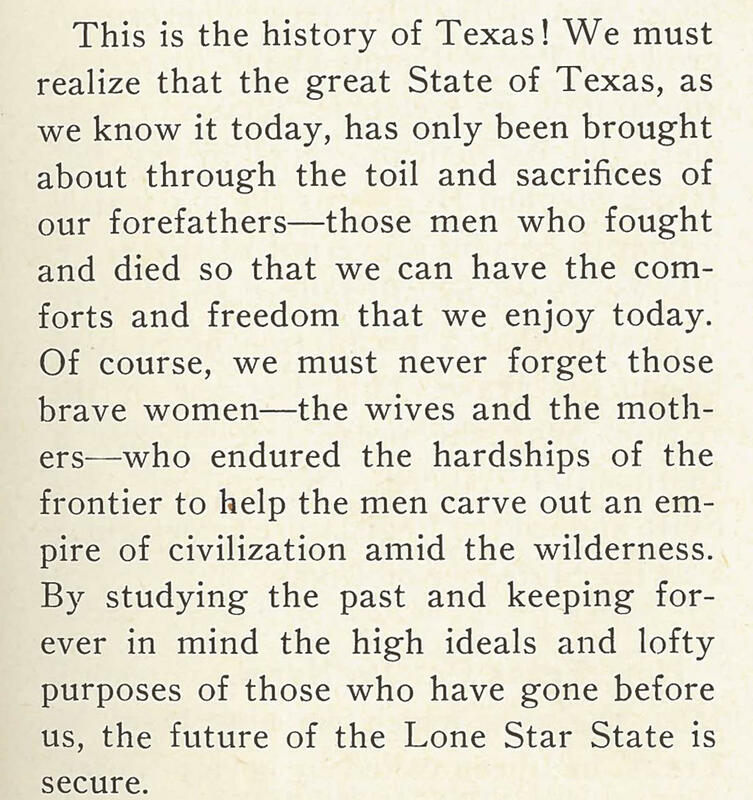 I know someone who used this 1954 Texas history textbook when she was in seventh-grade. She’s the person I borrowed it from for this story: my mother-in-law, Maria Garza-Lubeck, a ninth-generation Tejana who studied history on the way to her PhD. I asked her if the compelling narrative style “thrilled” her as a girl when she was reading it in middle school in San Antonio. Texas history textbooks used by seventh-graders today have improved by leaps and bounds. They now include more sober discussions of the Civil War, the women’s suffrage movement, slavery and civil rights. School districts have more leeway to choose their own materials and are not required to use everything adopted at the state level. This textbook from 1954 is a reminder that in the grand sweep of history, some critical self-reflection and a broader narrative scope can go a long way to improving how engaged children are in learning about where they’re from and where they’re headed. Update (Nov. 16 11:06 a.m.) – ​ The State Board of Education unanimously rejected a controversial Mexican American studies textbook in a preliminary vote Wednesday morning. The vote was 14-0 with Board Member David Bradley absent. What we are not doing is censoring a textbook. Nothing prohibits either of these publishers to print the books exactly as it is. Nothing prohibits them from resubmitting the book in Proclamation 2018 and nothing we do will prohibit them from selling them to public school districts in Texas. What we are doing is we are following Texas Education Code and our rules. We are not engaging in politics or personalities. The board is expected to take a final vote on the book Friday. Original Post: The Texas State Board of Education is expected to decide whether to approve a controversial Mexican-American Studies textbook this week. On Tuesday, the board took final public testimony on the book. Jessica Foulke teaches seventh grade social studies at a North Austin charter school. She says her students started texting her early on Election Night as the results came in. Many of them were worried because Hillary Clinton was losing.